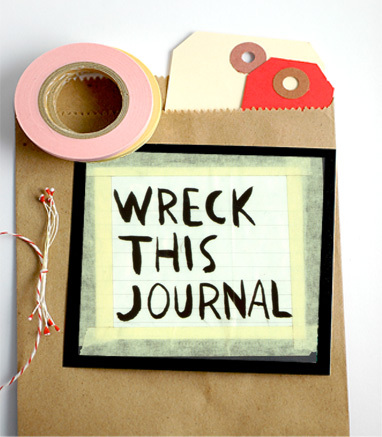 You may think Wreck This Journal project is dead. Maybe not doing posts on them gave you the clue? Ha, it may seem that way, but I am still wanting to do it. I left for NYC, and I forgot it on a stack of other items I meant to bring with me. It was discouraging, and I abandoned Kerri Smith's book for a time, but I'm ready to go back to it. I will never go sky diving, bungee jumping, hiking in a dangerous Safari anytime, but I have ripped out a page from a book and that's enough adventure for me. I'll post next Sunday the projects I did this week. If you're curious what Wreck This Journal project is, the intro is here, the other participants here. Thanks for playing along!